Cleaning your gutters is one of the most important projects on the to-do list yet it’s too often overlooked. Unfortunately, many of us wait until late into the fall season when the very last leaf falls before we decide to get it done. This delay exposes our homes to potential damage. Plus, it makes the job a lot more difficult to do. If you do it a couple of times a year, in the fall and spring, cleaning gutters is easy. Just once, or not at all, and it can become back breaking work and cost you thousands of dollars worth of trouble down the road. 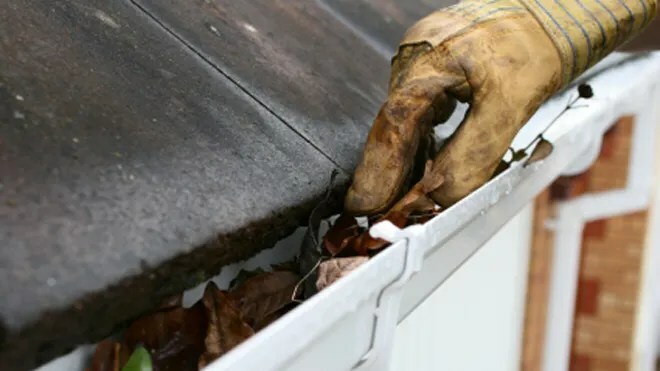 The problem with clogged gutters is more than just those annoying waterfalls that pour off the roof on rainy days, or the pretty icicles that hang around in the winter. This excess water wreaks havoc on the integrity of your home’s structure. The gutter system of a house is designed to move water down from the roof and away from the home and it’s foundation for proper drainage. Water that gets dammed up in the gutters finds the path of least resistance when it tries to drain and this often means it works right into the walls and ceilings of your house. The first and most obvious issue with gutters filled to the brim with leaves, twigs, and other debris is simply a weight problem. When that debris gets wet it absorbs the rain water like a sponge and becomes extremely heavy. This burden puts stress on the gutters and their hanging brackets, and can pull the gutters off the house. Falling gutters are costly enough to replace on their own, not to mention any lights or windows they smash as they come crashing down. Overflowing water from the gutters can also damage the paint and siding on a home, but unsightly water marks down the side of the house pale in comparison with what happens if the water get inside of a wall. Wet wood rots and loses its integrity, and this can go unseen behind the siding until it is too late. Ice-damming is another major issue with clogged gutters. Blocked water can freeze when it backs up in the gutters, pushing up against the roof structure and working its way under the shingles destroying the wood, causing even more leaks. Even flooded basements and cracking foundations are other symptoms of clogged gutters. If water isn’t drained away from the house and it pools around the foundation it will expand when frozen and cause cracks which lead to floods in your basement or crawl space. So what will you need to get the job done? You only need a few things and they depend on the method you choose. Many different tricks and techniques have been developed by home improvement magazines, experts, and handymen alike but the main concept is simple, just get on the ladder and pull the junk out of the gutters. You’ll need; a ladder, gloves, a container to gather the debris such as a bag or bucket, a garden trowel or small hand rake, and the hose. Begin by setting the ladder an arms length away from a corner downspout, and tuck a few garbage bags in your back pocket so you can easily pull them out. Some people prefer to use a bucket and bucket hanger for the ladder, but it is much easier to use those little plastic shopping bags. A full bucket or big garbage bag can get pretty heavy and make the job tougher than a high wire act. Hold your garden trowel or rake in your hand and begin your ascent. You never want to put sharp objects in your pocket when you are climbing a ladder, as they can harpoon you if you fall. Use the tool to pull the debris away from the down spout, being careful not to let any junk fall into the opening, which can create a clog. Take one handful at a time and fill up the bags, tying and dropping them to the ground as you go. Drop the bags away from the bottom of the ladder so they don’t get in your way when you need to dismount. Move the ladder and repeat. Never reach further than an arms length away from the ladder and be sure to get the dirt on the bottom of the gutter. A majority of it is from the asphalt shingles that run off into the gutter. This stuff gets very heavy when wet so don’t leave it in there. If you are afraid of heights or worry about dealing with the bags in such a precarious situation, simply grab handfuls from the gutters and drop it onto a clear spot on the ground. This is a very messy method, but you can rake up the debris later, safely and easily. Some guys drop the material down onto a tarp and shake it into a garbage can later. Once you clean an entire length, grab the hose and spray down the gutter and into the down spouts to get all the small pieces you missed. If there are clogs that the hose can’t clear, you can use a plumbers snake to clear them out. This is also a good point to see if your gutters leak at any corners or joining pieces. If they do, you can purchase a silicone sealant and very easily make the fix. Remember that water finds the path of least resistance, and that path us usually into the walls of your house, so a leaky gutter can be just as bad as a clogged one. If you are ambitious, you can scrub down the outside of the gutters or touch up any spots with paint to keep your house looking its best. Still hesitant on doing this yourself? Consider using a roofing or siding contractor, or even handy man, but get three estimates and don’t always go for the cheapest one. The guy with the 1970’s pick up truck with rock bottom prices could possibly do a great job, but may not have any insurance. Whom ever you choose, be sure they are insured. If someone takes a dive off the ladder and breaks every bone in his body and is not covered by his own workman’s comp you, the homeowner, are liable. It’s a lot easier to ask him for a copy of his up-to-date insurance papers than it is to make a claim on your homeowner’s insurance policy, assuming it even covers such accidents. One way or another, pushing this chore to the bottom of the to-do list could end up being a very costly mistake. If you get up there regularly it can be a breeze and you’ll prevent the Hoover dam from forming in your gutters. Jason Gurskis is a licensed home improvement contractor based in Mystic Island, New Jersey dedicated to making homes more comfortable, durable, and energy efficient. Holencik Insulation provides a wide range of services for residential and commercial gutters in Reading, PA. We are available for professional gutter cleaning, gutter repair and gutter installation, as well as gutter guards and several other home maintenance services. Our customers will enjoy prompt, reliable service from the best trained gutter mechanics in the industry. Contact us for one time gutter cleaning or regular maintenance. Our expert mechanics use the latest equipment and our proven gutter cleaning techniques to remove the debris that collects in your gutters. We also inspect the entire system for the correct pitch and look for damage at any point in the system. Gutter cleaning is one of our many services for residential and commercial gutters in Reading, PA. We offer expert gutter repair, gutter guards and new gutter installation from a team of highly trained gutter mechanics. If you need your gutters replaced, we use only high quality materials that are covered by a twenty year warranty. Our workmanship is guaranteed. We will also inspect your roof and siding. Then let you know if there are any issues that need attention. At Holencik Insulation, we provide free quotes for our services. You can request a free quote by filling out the form to the right for fastest service or by calling our office at 484-892-2816.